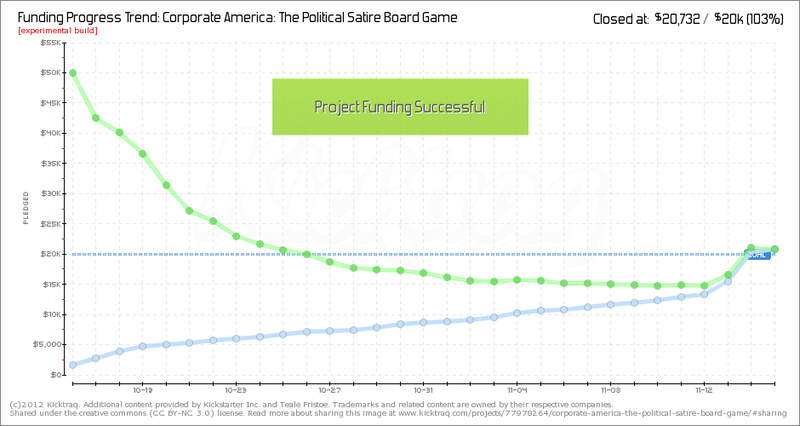 So, it’s been about two weeks since the Corporate America Kickstarter finished up, and I’ve been pretty much silent! What gives? The gorgeous funding curve for Corporate America. Image from Kicktraq. Before I answer that, you might be interested in seeing the curve for the project. Check it out. It’s right over there. 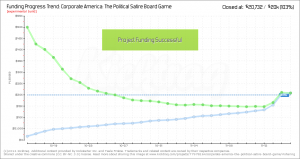 The first thing you’ll notice when looking at the curve is that the project was a success! Yay! I have to say, that makes me incredibly happy. 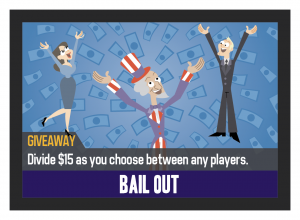 Corporate America is going to be a real game! The extremely stressful trending curve for Corporate America. Image from Kicktraq. The next thing you’ll notice is that it was a real nail biter. Check out the trending graph over there to the left. You’ll notice that the project blasted off the starting line, heading straight for $50k! 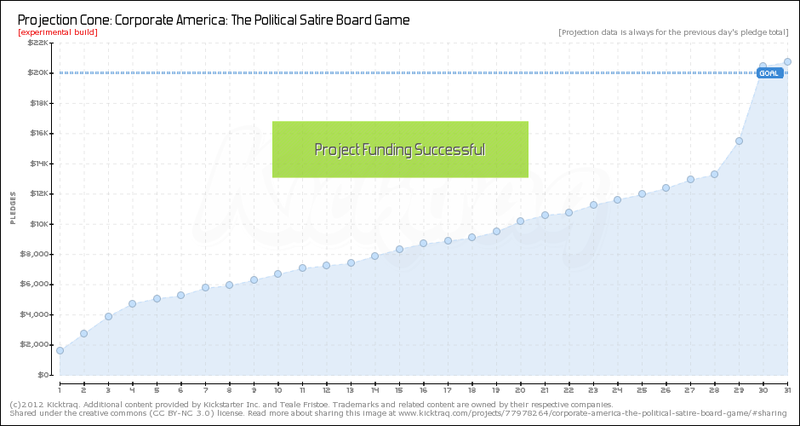 But the trend dove from there, and after two weeks, it didn’t even look like the project was going to be funded. This made me incredibly sad. For much of the project, things were not looking good, and by the last week or so, I was convinced the Kickstarter would not succeed, and even started figuring out what I would be doing next with myself. Then, in two of the most exciting days of my life, the project turned around at the very last minute! I was aware that Kickstarter curves often follow this pattern (explosive start, plateau middle, explosive finale), but this was more extreme than I would have imagined. In the last day of the project alone, people pledged a full 25% of the total goal, for crying out loud! I hope you can understand why I was completely blown away. So, why have I remained silent until now? Well, part of it is that I’ve been busy working on Corporate America. There is a ton of work to do before I’m ready to send the game to the printers and fulfill my promise to my backers, and not a ton of time to do it. But the main reason is that I wasn’t prepared for a victory blog post. I didn’t know what to say. For weeks, I had been mentally preparing to write concession blog posts. I had a series all planned out where I would discuss why the Kickstarter didn’t work. But then it had to succeed, throwing a wrench in my plans! What can I say about a successful Kickstarter? Turns out, a lot of the lessons I learned about a failed Kickstarter are still very relevant. My experience was far from smooth sailing, and I hope the rocky bits will help me and anyone else who might run another Kickstarter in the future better prepare. But I don’t want to talk about what I did wrong today. Instead, I want to talk about a couple of things I did right! Obviously, running a campaign like this is very complex with tons of moving parts, so it’s tough to isolate one or two specific reasons for the campaign’s success. But I’m going to try anyway. And first up is the real doozy, the lesson I learned even when I thought the campaign was not going to succeed. * Of course by this I mean the funding for my project gets high. Even in the darkest part of the campaign, when I was sure my hopes and dreams would not materialize, there was one (admittedly huge) silver lining: it turns out I have a lot of friends. I actually have a ton of friends! And they believe in me and want me to succeed! Now, don’t get me wrong. My friends didn’t support me just to support me (at least most of them didn’t). They supported me because I’ve made a really fun and interesting game, and they know that. But the generosity and support I received from so many people completely blew me away. I never expected so many people in so many places around the world from so many chapters in my life to step up and help me make this happen. It is truly an amazing feeling that reminds me how fortunate I am! In case you’re wondering, I kept track of the number of my 326 supporters who were friends and who were people I didn’t know. Keep in mind that “friends” in this sense mean many different things. At one extreme, there are my parents, brothers, and girlfriend. At the other are people I met at a single game night. If I recognized a supporter’s name and could directly contact that person to thank them, that’s a friend. In the end, slightly more than one third of my supporters fell in the friend category. That said, friends contributed well over two thirds of the total contributions I received. Many friends were EXTREMELY generous with their monetary support, and made a huge difference in making this project happen. But you know, it wasn’t just the monetary support. Many friends told their friends about the project, which also helped find many additional supporters. I can’t tell how many people contributed in this friends of friends category, but it wasn’t insignificant. And even more than that, many friends offered support, encouragement, and advice throughout the project, which was essential for me, especially when the project wasn’t looking good. I started the campaign pretty ignorant in a lot of ways, and friends encouraged me to update the project page, send updates to supporters, talk about the game, and incorporate new reward tiers, which made a huge difference. Left to my own devices, it’s likely I would have given up without nearly as much of a fight. I’m greatly indebted to friends for not letting me do that. So, the first big lesson I learned is that I have a ton of awesome friends, and that without their support I couldn’t have done this. That’s a really great thing to learn, and it would have been great even if the project didn’t succeed! 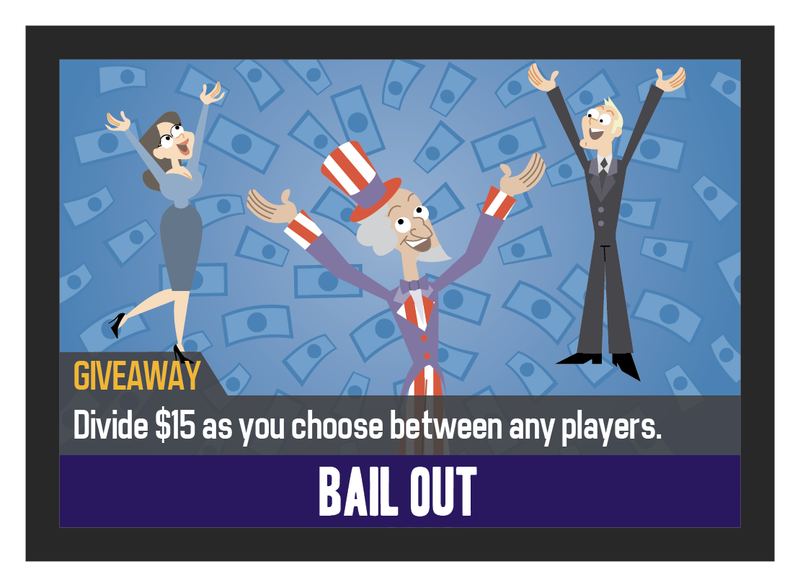 How would I recommend others use this lesson for future Kickstarters? Make sure that you have a lot of friends who believe in you. If your friends won’t support your endeavor, why would you expect random strangers to? One thing I really wish I had done before the campaign is go to more board game conventions to meet even more people. The power of personal connections shouldn’t be underestimated. This is a mistake I won’t repeat for next time. I know Corporate America is sweet. I have played it a lot myself and have enjoyed it every time. Probably 95% of people who have played it have had a great time with it. The mechanics are solid and original, the theme makes it relevant and interesting, and the humor helps create a festive atmosphere. Duh. Why am I sitting here shamelessly tooting my own horn in front of you all? Because even though I knew it, that doesn’t mean anyone else in the world knows it. A random person on the internet will see a few words about it. They might see a picture in an ad. If they happen to go to the Kickstarter of official web site, there are some silly videos, a couple of reviews, some pictures of a prototype, and some text they probably won’t read. Random person on the internet is constantly bombarded with ads and opportunities to spend money. Why would random person on the internet give my game the time of day? It turns out most won’t. I believe that Corporate America is better than most games out there, but that doesn’t mean anyone else has any reason to believe that. This seriously almost cost me the campaign. I went into it without enough material to show people how good the game is (thankfully, some friends were willing to let me record them playing, which helped prove that the game works), and without a good plan on how to get the word out (I naively thought word of mouth was all I needed). But we’re getting into the “stuff I didn’t do right” category here, which is for another blog post. Today, I’ll just say that thankfully, Corporate America is awesome, and I was able to scrape together enough material to convince enough people of that. I know that once they get production quality versions of Corporate America, they will not be disappointed. I spent the final hours of the Kickstarter campaign as I spent much of the campaign: alone in my little office nook in my apartment. Though I was alone, I felt anything but lonely. I was constantly engaged with people online, and I could practically see the excitement they felt about the project. While this lesson might tie to the friends one, I think it’s an important and unique one in itself. 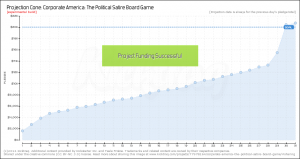 I’ve discussed before about how Kickstarter projects are like games in many respects, but going through the experience made me realize the comparison is even more accurate than I thought. Supporters become emotionally engaged! They want to see the project succeed! And it’s not just because they’re excited for the product. They’re excited because they’re a part of something big that is really happening! As the final dollars were pledged to the campaign, I felt like I was counting down to New Years, even though I was sitting alone in my apartment. I was celebrating with a ton of friends, but I was also celebrating with people I’ve never met who contributed early to the campaign, watched it struggle, offered their support and advice, and were there to see it all turn around. One of the reasons Kickstarter is such an amazing phenomenon is that it’s not a store, it’s an experience. You’re not just buying a product when you pledge on Kickstarter, you’re buying a roller coaster ride that YOU can help make more exciting! I’ll be discussing this more in my next post, when I talk about one of the most dramatic events that occurred during the Kickstarter campaign, how I handled it, how I wish I handled it, and how in the end it worked out for the best, getting people more engaged with the project. Until then, I just want to give everyone another huge THANK YOU for your support and encouragement. You guys are awesome, and I can’t tell you how much it means to know that you all have my back!